Today it is business as usual at The Detail, Below The Radar and Fine Point Films. As always, we will continue to leave no stone unturned in our public interest journalism. Our team is here to investigate and produce stories that matter. We want to say a huge thank you for the overwhelming support received since Friday. There are too many people to acknowledge individually but we particularly appreciate how the journalist community locally and wider afield vociferously rallied to our side. It was heartening to read the statements issued by the National Union of Journalists and Amnesty International NI and, of course, the wider public whose interests are always at the heart of our work. As you all know, on Friday our award-winning and respected journalists Trevor Birney and Barry McCaffrey were arrested and held at a Belfast police station in connection with our documentary No Stone Unturned. This film examined claims of state collusion in the Loughinisland massacre in 1994. Meanwhile, PSNI and Durham Constabulary police officers raided our city centre offices and left 13 hours later after searching through every desk and cupboard. Our legal team challenged the legality of this search in a hearing at Belfast High Court on the same day. The result was that all computer equipment and documents seized must remain sealed until a further court hearing due this Friday. Trevor and Barry were released without charge. The Durham Constabulary-led investigation is into the suspected theft of confidential documents and these are allegations our colleagues robustly deny. Most importantly, the Loughinisland families are still seeking justice 24 years after their six loved ones were brutally murdered by loyalists. The victims’ names are: Adrian Rogan (34), Malcolm Jenkinson (52), Barney Green (87), Daniel McCreanor (59), Patrick O’Hare (35) and Eamon Byrne (39). They must remain the focus. It is clear that the arrests and raid on Friday were an attack on press freedom. Here at The Detail, Below The Radar and Fine Point Films our journalists will not be deterred from doing their jobs. We are extremely proud of our investigative journalism. We will always seek to expose injustice and shine a light on the truth. We will continue to turn over the stones that others wish we would leave alone. 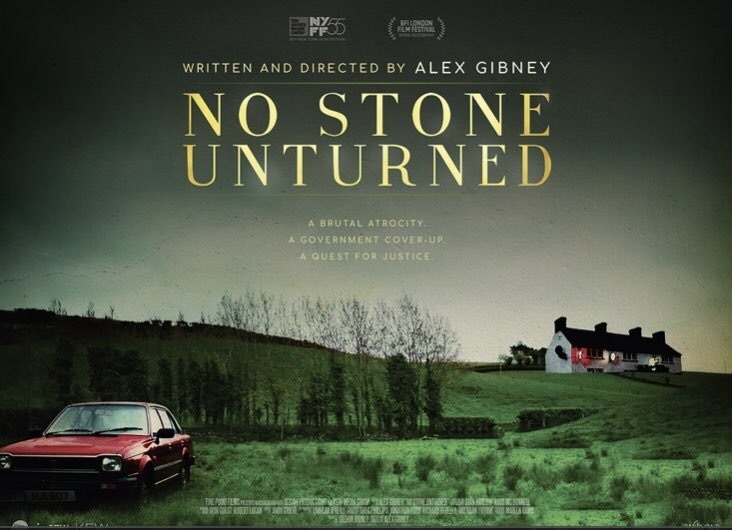 No Stone Unturned can be viewed on Amazon Prime.